If it weren’t for the metadata attached to these photos, as well as a recently developed habit of scribbling dates on the paper copies of my patterns, I never would have been able to recall when I started or finished this project. Clearly at least a season ago, judging by the outfit. 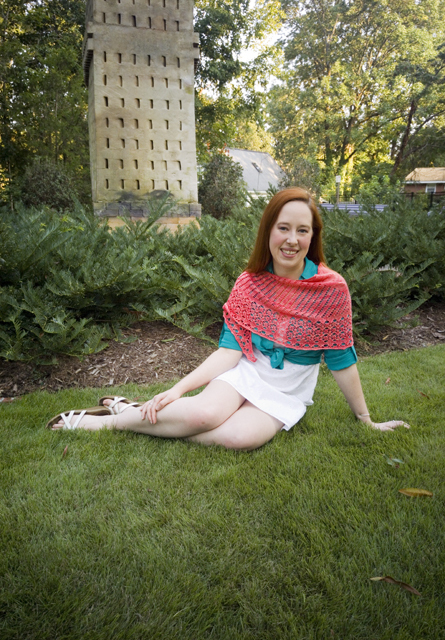 As it turns out, I knit up this shawl between the end of July and the beginning of August—nearly half a year ago. The project didn’t begin with the knitting, though. 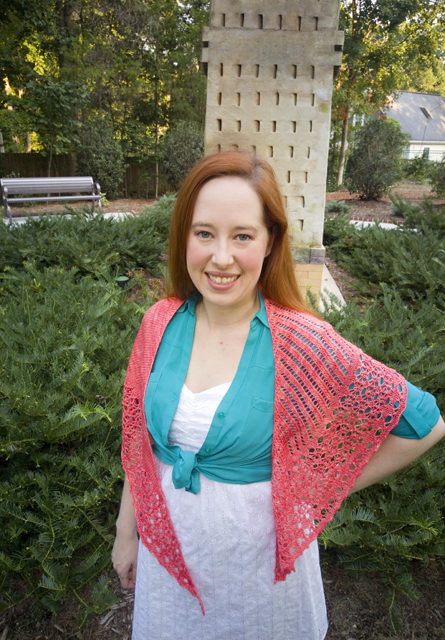 No, it all started with the yarn, which began its life as the leftovers from my So In Love cardigan (Ravelry link), which apparently pre-dates this blog by a year. 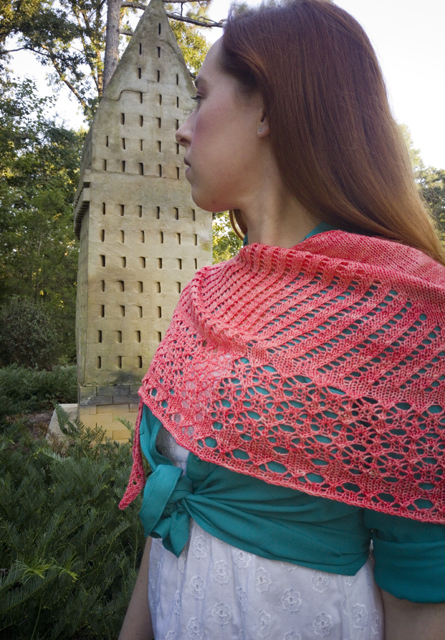 I had an entire skein still in my stash, the perfect amount for a shawl. But I didn’t really want another item in the exact same shade of pink, and I wasn’t sure that the slightly cooler tone would be particularly flattering near my face either. It was the perfect candidate for a little over-dyeing experiment. 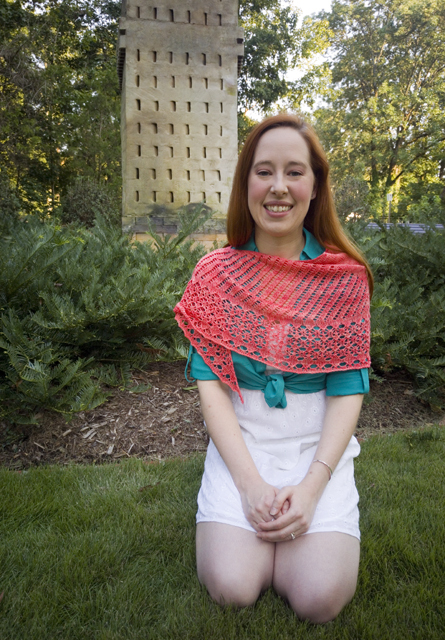 My goal was a warm, orangey-pink coral, which I hoped to achieve using Rit liquid dye and the stovetop method. For my first attempt, I referenced the Favorite Rit Dye Colors handout and followed the recipe for Coral, which calls for 1/2 cup Petal Pink and 2 tbsp of Tangerine. 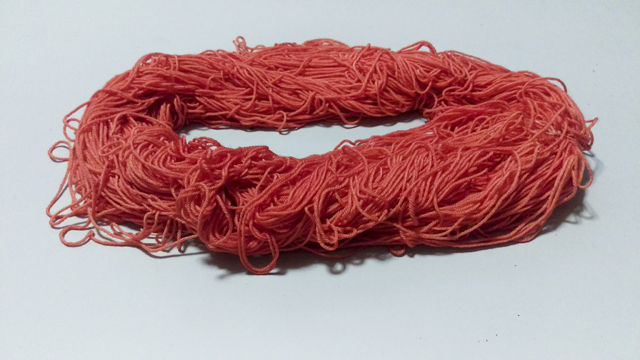 (Interestingly, there’s another color with the same liquid dye decipe, called Sea Coral (Pink). They have different powder dye recipes, which, combined with my own results, leads me to believe that the Sea Coral one is a misprint.) The result was a saturated hue that was almost neon in its intensity, and more orange than I expected to boot. I picked up a package of Rit Color Remover, which worked shockingly well—and fast. As soon as the yarn touched the water, it bleached to a natural cream color. I followed the directions for soaking, again using the stovetop method, and then rinsing. I honestly don’t recall if I also washed the yarn afterward as instructed, but if I did I would have used Eucalan as my detergent. Sidebar: I suspect the wool content in Cascade Heritage Silk is made into a superwash yarn using a method that glues the scales down, rather than removing them, because after bleaching the yarn seemed a lot grippier, like a non-superwash wool would be. I think the bleach dissolved the glue. I’d be interested to know if anyone can confirm or reject this hypothesis. As you can probably tell from the pictures, the dye didn’t take evenly on the second pass. Instead, it produced this lovely semi-solid color, which I quite like: it looks hand-dyed now. Compared to producing a satisfying color, choosing a pattern was a breeze. Not only had Marisa Hernandez’s Crooked Cathedral been in my favorites for ages, but my yarn turned out nearly the same color as one of her samples! Details on the knitting itself are on my Ravelry project page. It’s been bitterly cold the last few days, far too cold for such a lightweight neck covering, but seeing seeing it shine in my closet, like the light slanting through a stained glass window in late afternoon, warms my spirit.